Violent clashes erupted in the heart of Cairo on Wednesday as thousands of supporters of Egyptian President Hosni Mubarak poured into the streets to confront the huge crowds of protesters who have transformed this country's politics in the past nine days  a signal that the battle over who will succeed Mubarak could turn extremely bloody during the weeks and months ahead. The two sides fought each other with bricks and pieces of metal as the Mubarak supporters stormed into Tahrir Square  the heart of the uprising  on camels and horseback, in an effort to break the protesters' hold on the square and seize control amid the turmoil. Many anti-government demonstrators have camped in the square for most of the past week, sleeping little and living with razor-edge tension. Mubarak announced on state-run television on Tuesday night that he would not seek another term in office when presidential elections are held in September. But days before Mubarak made his concession, small groups of loyalists were already gathering along Cairo's Corniche, the broad boulevard adjacent to the Nile River, chanting pro-regime slogans and inching ever closer to Tahrir Square, less than a kilometer away. Then, on Wednesday morning, within hours of Mubarak's address, loyalists of his National Democratic Party (NDP) began gathering in greater numbers in groups across Cairo. On the Corniche, men, women and children danced in the streets, chanting, "Long live Mubarak," and "No, no, he won't go." The regime loyalists erected a professionally printed red banner that read "Thank You Mr. President" in both Arabic and English. By lunchtime, the key 6th October Bridge, which spans the Nile in downtown Cairo, was crammed with Mubarak supporters, and cars began tooting their horns, Egyptian flags flying out of their windows, as the hubbub rose in volume and the crowds thickened, many holding aloft photos of Mubarak and chanting for him to stay. "Mubarak has ruled us for 30 years," says Mohamed Labib, 29, an advertising account manager, who held a photo of the President. "Having Mubarak out now will create chaos in the country." Similarly jubilant scenes were visible among the protesters in the square an hour before the clashes began. Families, including young children and groups of teenage girls, thronged around speakers from various political parties before participating in mass prayers. A thin line of armed, uniformed soldiers was all that stood between the two groups. Then, within minutes, the festive atmosphere on both sides  complete with dancing, drumbeats and cheeky slogans  was replaced with fighting. Several hundred pro-Mubarak men broke away from the Corniche and headed toward Tahrir Square. They were visibly angry, though it was unclear what, if anything, had provoked them. "Whoever is with Egypt is with the President," they chanted. They pushed through the line of soldiers and overwhelmed the volunteers who were checking identification cards and bags to help deter troublemakers. Several soldiers who had tried to keep the two sides apart quickly withdrew. As the pro-Mubarak forces pressed into the space, the protesters formed a human chain to try to keep them out of the area. The square  a giant open area surrounded by hotels and the National Museum  had been cordoned off by military tanks, with just two choke points to allow people in and out. "We love Mubarak! We love Mubarak!" the men yelled as they charged into the square. "Yalla shabab! [Come on, guys!]" several anti-Mubarak youths yelled to their compatriots, urging them toward the invaders of what had been their turf. "We will only die once!" "These are bad people who want to come and fight us," says Azher Bedar, 36, an advertising salesman, whose arms had been locked in a cordon with other protesters at the beginning of the confrontation. "Mubarak has paid them to come here and make himself look like he has popularity." Next to him, Khaled Mahmoud, a 23-year-old communications student, says he believes the Mubarak supporters "don't represent Egyptian people at all. We are the real Egyptian people." The pro-Mubarak crowds pushed at the entry points of the square, shouting in fury as the anti-government protesters chanted, "Go home! Go home!" The pro-government marchers carried banners that read "Egypt means Mubarak and Mubarak means Egypt. If there is 1 million No, there are 82 million"  meant to belittle the dissident claim of a million-strong protest against the total population of the country. Then some pro-Mubarak groups arrived on horses and camels and crashed through the cordons. An observer said that camels could be brought into that part of Cairo only with official and military permission, given the extraordinary circumstances. "All Egyptians support Mubarak," Sharif Mohammed, a tour guide, says as he tries to push his way into the square. "He's our father." "God help us," says Mustafa Elsheen, a member of the Muslim Brotherhood. "We were praying peacefully, you saw us. There are dozens of men who have been injured, some very badly with head wounds. God help our country. We will not be frightened by these thugs. We have our cause, we want our rights. Why are they being violent? They can come to the square and say anything they want, but why the violence?" Shortly before 4 p.m., clashes took place in front of the Egyptian Museum as both sides seemed to hurl chunks of concrete at each other. 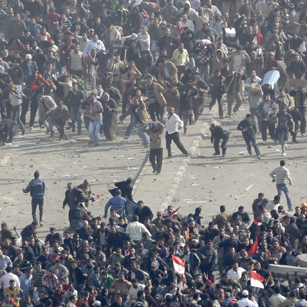 From the balcony of a nearby building, a TIME reporter saw the pro-Mubarak crowd surge forward into the square to begin a hand-to-hand battle with the anti-government crowd. Then came a round of gun shots, which rang out close to the museum, though it was not clear who had opened fire. Hospitals around Cairo filled up with people who were injured in the fighting. Although it was not immediately clear how the pro-Mubarak march was organized, it appears that some of the direction came from the NDP, whose headquarters, which overlook Tahrir Square, were torched on Jan. 28. "The demonstrations started off peacefully," says Hussein Omar, an Egyptian graduate student at Oxford University who had returned to Cairo to witness the events and found himself trapped on a balcony overlooking the square. "Then, suddenly, there were rumors that the government was sending in horses and camels, and sure enough, riders charged the crowd but were forced back by protesters forming a human chain. I've seen at least 50 severely injured or dead people. The army sometimes tries to help, when the crowd ties up violent thugs and hands them over to the army, [but] people are starting to wonder why the army isn't doing more to stop these infiltrations. It's all very methodical. [Pro-government gangs] have encircled the square, and then one at a time they try to force their way through an entrance and are pushed back by the human chain. Then the [pro-government gangs] try again from another way. I'd be very surprised if this wasn't planned." See a brief history of people power. See how Egypt's youthquake is at the center of the revolution.